After the many requests for this recipe and how-to, I thought I’d take some pictures and post this recipe. My brother in law is getting married tomorrow, and since he and his lovely bride-to-be met at Starbucks, a Starbucks themed rehearsal dinner – with these cupcakes for dessert – was quite in order. Keep in mind that at the end, you’ll see two different kinds of cupcakes – I did Caramel Frappuccino ones and Double Chocolate Chip Frappuccino ones. The recipe you’ll see here is for the caramel ones. 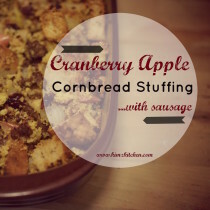 I borrowed very largely from this lovely blogger here for the recipe and inspiration! Heat the milk in the microwave or on the stove until hot – stop short of a simmer. Stir in the instant coffee until well blended. Add the vanilla and set aside. Sift together the cake flour, baking powder, soda, salt, ground coffee and cocoa. 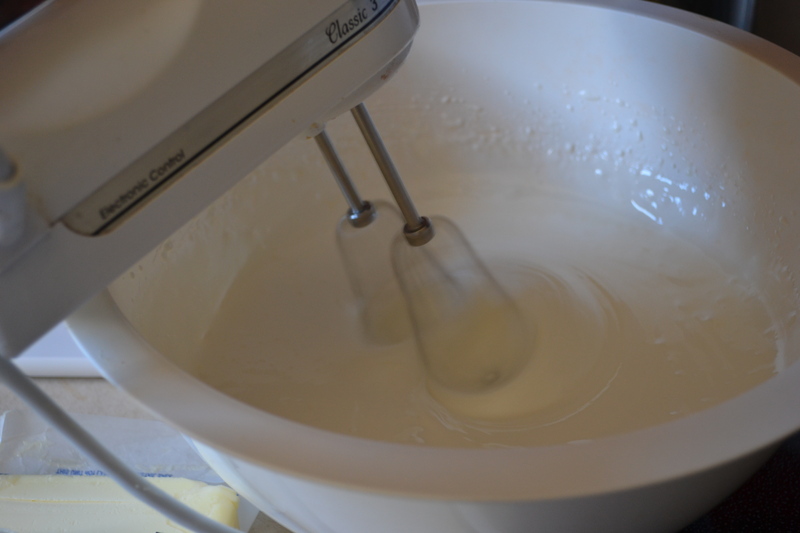 In the bowl of a stand mixer, beat the butter and sugar with the paddle attachment until creamed. It should be slightly fluffy. Beat in the egg yolks one at a time. Add 2/3 of the flour mixture and the sour cream. Add the remaining flour mixture and milk. Beat until smooth. Scrape all the batter out into a separate bowl and wash the mixer bowl thoroughly. 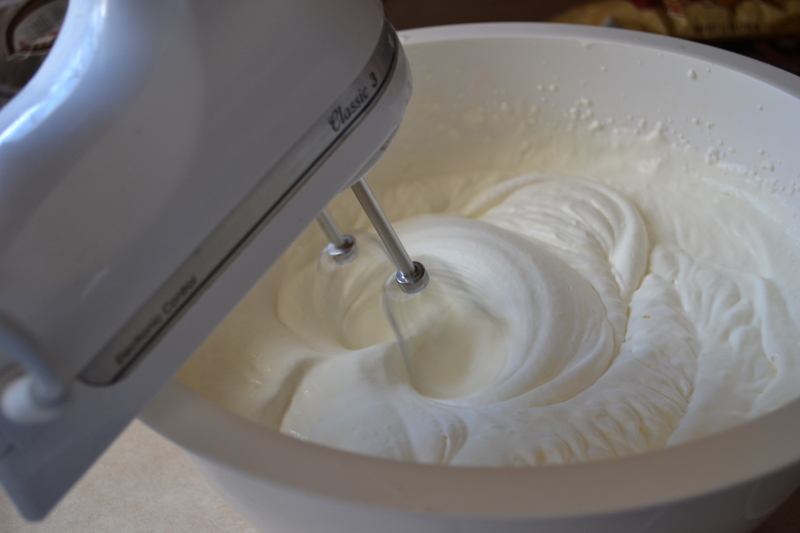 Switch to the whisk attachment and beat the egg whites until stiff but not dry. They will hold a stiff peak but they will still slip around a little in the bowl. Fold the egg whites into the cake batter gently, folding the batter around until well combined. NOTE: You can cut this recipe in half – you’ll have enough for one batch of cupcakes. But sometimes you might like to have more…you know, just because. Whisk sugar, yolks, water and Starbucks via in large metal bowl. Set bowl over saucepan of simmering water (do not allow bowl to touch water); whisk until candy thermometer registers 160°F, about 8 minutes. Remove bowl from over water. Using electric mixer, beat egg mixture until cool and thick, about 5 minutes. 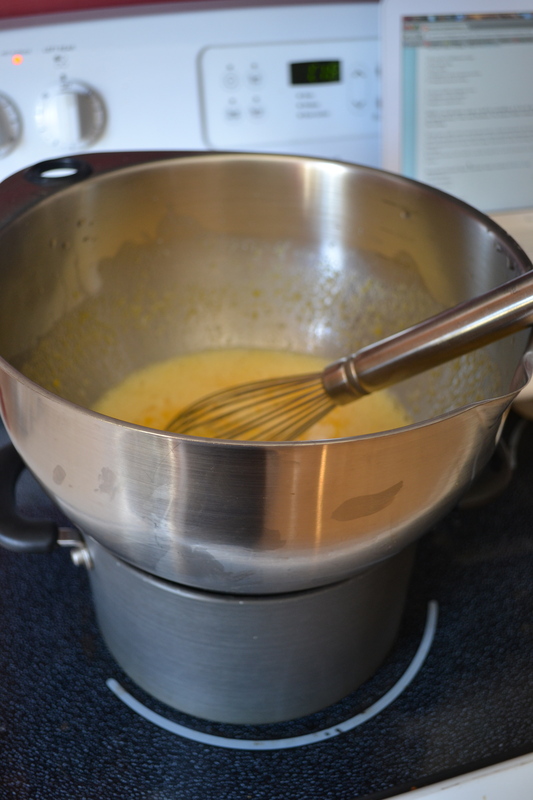 Fold cream mixture into egg mixture. For the Homemade Caramel Drizzle – this one I didn’t do today because I had some already pre-made in the fridge…don’t skimp on this or (gasp!) buy it in a jar from the ice cream topping aisle – this stuff is AWESOME! I’m pretty sure it could cure chicken pox. Cut butter into evenly sized cubes and melt over low heat in large 3-4 quart saucepan. Once butter is fully melted, add brown sugar, being careful to avoid the sides of the pan. If any stray sugar crystals fall onto side of pan, carefully brush off with a wet pastry brush. Once butter and sugar are fully combined, add corn syrup and condensed milk. Clip on candy thermometer to side of pan. Cook mixture on low heat (still continually stirring) for about a minute or two. 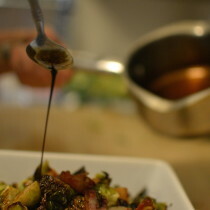 Increase heat to medium and continue to cook/ stir until mixture reaches 225 degrees. 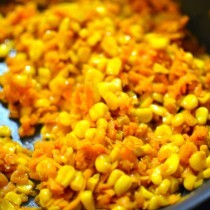 Once the mixture is removed from heat, stir in vanilla extract. Once cupcakes are cool, core out the center of each one. Using a pastry bag, pipe a small amount of caramel sauce, then pipe coffee mousse until the center is almost full, and then top with another piping of caramel. Once all cupcakes are filled, pipe swiss meringue buttercream onto each one using a pastry bag fitted with a large star tip. Lastly, use a sturdy plastic freezer bag or disposable plastic pastry bag with a small hole cut out of it and drizzle caramel on top of each cupcake. 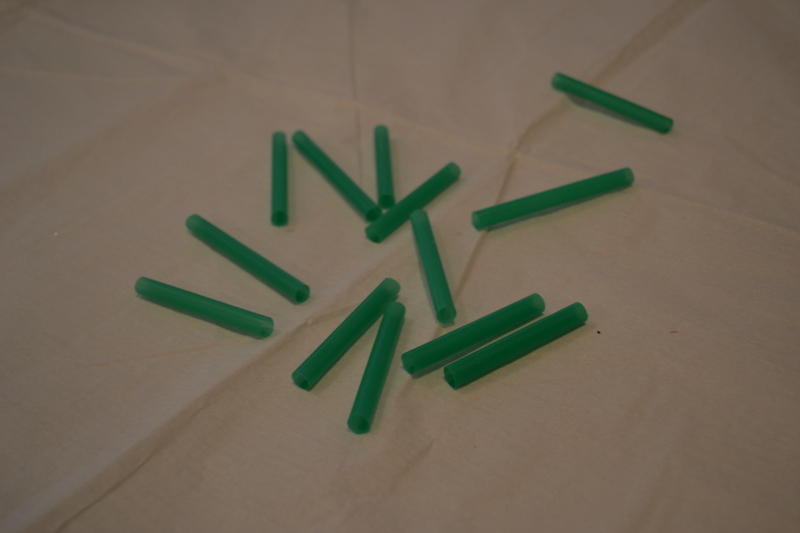 Now for the special part – (I always like to have some of these ‘special parts’ on hand) – take some starbucks straws – go ahead, stuff a few in your purse. One straw makes four tiny cupcake straws. Cut them in half, then in half again. Wow! Those look fantastic. Can’t wait to try that recipe. Copyright infringement is stealing. “I am a sinner, miraculously saved by grace, living by faith, and pressing toward the mark of being more like Christ.” Hypocrite. I think i’ll pass on this recipe. Thanks anyway. Hey you’re so welcome! And I’m so sorry I gave you a false impression of what it means to follow Christ! Most of the people who know me personally recognized my joking here. I’ll have to be more considerate of those who don’t know me personally next time. In case you’re interested, Starbucks’ marketing team actually asked to post my recipe and blog post because they loved what I had done so much. When they posted my recipe on their facebook fanpage and recommended it to their fans (and I got 42,000+ views in less than 6 hours! ), they really gave me and my small-town blog a huge push. Knowing that they heartily approved gives me the peace of mind I need to keep my conscience clear before God and men. Again, though, I appreciate your concern! I’ve attached a screen shot of Starbucks’ approval in case you’re interested. not copyright infringement anyway.. Sheesh. I’m gonna attempt these! Great job! WOW…Jenna, there is only one true judge.  Kim, thank you for posting the recipe and sharing your story and your self with us!! Wish you all the best!! You can also use the actual cardboard sleeves from Starbucks. Just pull them apart, make them about an inch in diameter smaller and hot glue back together . Cupcakes fit in them perfectly! It is not infringement if you are not selling them! a co-worker saw them on pintrest and brought to work (to give of course! ) and i have to say, i am not telling you how old I am but i have grandchildren 🙂 THAT WAS THE BEST CUPCAKE I HAD EVER EATEN IN MY LIFE! Bless you for sharing that tidbit about yourself and remember not to live by others judgement of you. Bless your sweet children and best of luck and prayers to the one yet to come. My hats off to you, Kim!!!! Very well said!! it’s not infringement or stealing if you are not selling them. GEEEEZ it must be a hard dark road you travel to judge so harshly. I am appalled at your reply..If you didn’t like it just pass..does god tell us not to judge..LIKE CALLING SOMEONE A HYPOCRITE! 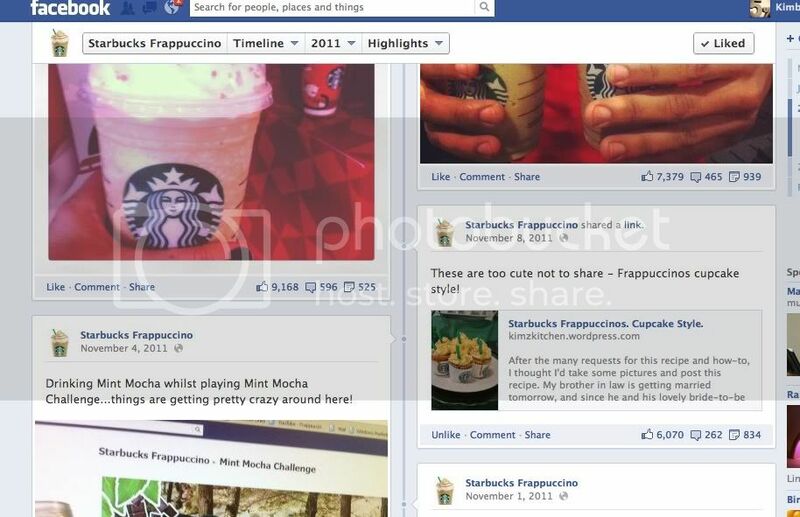 and I actually think it’s pretty funny that you look pretty silly now seeing it on Starbucks FB Page! LOL! Some people These days! How is it copyright infringement when she is using the product IN the cupcakes! Yes! I love this!!! If you’re not too busy, can you inbox me of facebook the measurements because I’d have huge pieces of paper cut up, and would make a mess! Im interested in making coverings like this for a baby shower…. Oh, and are these the regular 12 batch sized cupcakes, or the minies? I can’t really tell by the picture. Please stay incouraged, inspite of the many negative remarks you may recieve by letting your light shine. The measurements are the same as the cupcake holders. I just lined them up and cut away! Great questions! And thanks for the sweet words of encouragement!! I would be interested to see the recipe for your double chocolate chip. You know – I was just on here thinking that…I would not be burdened in the LEAST to make another batch of those babies. 🙂 I might have to whip those out this weekend or something – the icing is the same – and the filing is mostly the same – but the cake and drizzle are obviously different. Those were my personal favorites though – since I’m not a coffee drinker. Those are great. Did you make the wrappers or get them from SB? How to do the wrappers was posted above. Definitely – I’ll have them up this week! They were my personal favorite, so I’m sure you’ll like them too. Yeah the recipe for the Double Chocolate Chip Frappicino would be awesome! I can make them and have them ready for a party! These look delish! Please, please,please post your recipe for the chocolate ones. I gained 5 pounds from their happy hour over the summer. Oh my word – you would SO gain pounds with these cupcakes – beware. 🙂 I’ll definitely be posting that recipe this week. P.S. I was in Starbucks the other day and the kind lady told me how they make their whipped cream, for an extra hint of authenticity. It’s just their vanilla syrup and heavy whipping cream in one of those reusable whipped cream canisters. Apparently you can buy the syrup or I’m guessing some mixture of vanilla extract would do. I wouldn’t use vanilla extract, but you can go to Starbucks and buy a bottle of their vanilla syrup from their back shelves. (Same with most flavors except the seasonal ones that come with a different pump–i.e. pumpkin spice). We use eight pumps of vanilla to each 16 oz. heavy cream. After shaking with the CO2 cartridge it has a shelf-life of 48 hours. What a cute idea! I hope I don’t get caught taking a few extra straws home on my next visit! Yes ma’am! I’m planning to get it up by the end of the week! These look DIVINE!! I can’t wait to make them. Any chance on getting the Double Chocolate Chip Frappacino recipe? Caramel Frappacinos are definitely my favorite but the Double Chocolate Chip Frappacino is very very close behind. You’re sweet – no pun intended. hahah! 🙂 I’ll get that recipe up by the end of the week. the recipe tells us exactly how to make’em and it does’nt hurt to try making some for the hollidays. You go for it – they’ll be the hit of the party for sure! Please post the Double Chocolate Chip Frappuccino recipe. Would be great for parties!!! I am going to have to grab some extra straws while I am there next time. I will have to think of what to wrap around them….can’t go taking all their cups…lol! a few comments down, I mentioned how to make those cupcake liners – super simple if you have a printer…maybe I’ll add that to the post with the DCC frap recipe the end of this week. that is so, crazy but cool too. It looks like someone has a lot of time and patients to do all this. I don’t mind baking but I don’t I’ll have the patients for all that. I also liked the way the came out too. I have no patience either for this, but sometimes you have to do things once in a big way. I would love to have the Double Chocolate Chip recipe as well! They look amazing! This looks so amazing. I hope it tastes as good as it looks. Yum!!! Oh my goodness, so cute! I’m going to have to throw a coffee themed party just so I can make these! Congratulations on being linked to from the official Starbucks facebook page! This is so brilliant! Great post! 🙂 I love it! Oh my gosh, Kim. When can the Worthwhile office place our order??? I can’t wait to make these; but I also am looking forward to the double chocolate chip recipe. OMG! You are wonderful!!! I love the tip on making the cupcake wraps. This is GREAT!!! Thank you so much! are they normal size cupcakes? Where did you find the cupcake cups? This is like a little primer on making cupcakes! thanks for the great lesson! So I made these yesterday! The coffee mousse was a little too liquidy and the butter meringue a little too buttery. Any suggestions? The caramel sauce can definitely cure any disease I agree!!! I also suggest making larger cupcakes so there is more room for the frosting in the center! I’d love to hear if your mousse was as liquidy as mine or if it’s supposed to be that consistency because it was hard to pipe and keep in the cupcakes! Congrats! You did it! They are rather intensive, aren’t they? 🙂 I will admit there is a little learning curve on that mousse – you have to make sure you beat it really good after you cook it – so it’s as thick as you can get it. Then make sure your heavy cream is as thick as it can get – and fold – not mix – it in. I also noticed that if I refrigerated it a while before I filled the cupcakes, it helped it stay thick as well. The mousse for the DCC cupcakes is MUCH thicker, because it has chocolate chips in it…. I looked at the recipe again, and I realized that I took out one of the sticks of butter the last time I made it and I like it better. I’m editing the recipe now to reflect that. Also – I used the Pampered Chef Stoneware Muffin Pan to make them in – I’ve found those pans make a tad bit bigger cupcakes than regular muffin tins. And to core out the middle, I used the small Pampered Chef cookie scoop. Those things made them easier for sure…but you could do them with a regular spoon if you’re really careful. I did a test run for Thanksgiving! My boyfriends family loves coffee and I think they will go great after dinner! They were intense… took 3 1/2 hours from start to finish but I was super pleased with myself haha! My boyfriend took them into work today, he’s a teacher and I got back great compliments on them! I used a 1/2 teaspoon measurer to core out the insides and that was really easy to do! For the finely ground coffee in the cake recipe I used Creme Brulee coffee and it gave it a really nice caramelly flavor that complimented the cupcake, I recommend that or perhaps another type of caramel flavored coffee. I used the french roast for the via… did you use that the italian one or columbian.. I couldn’t make up my mind!! I’m planning on using a muffin pan for them next time, I just need to find some cute holders for them. I also found out that Starbucks sells their caramel during the holiday seasons, however it’s not the same that they use in their stores regularly… which I found to be odd!! I’m interested for the other recipe as well as I’d like to make 2 of them. I was also thinking of deconstructing the Salted Caramel Mocha Frappacinos… what do you think? Want to try and work on the recipe together?!?! I actually used the caramel starbucks via coffee – but I noticed that it wasn’t available in all stores around here – I think the one I got was at Publix. So, for the VIA, when you say a package, do you mean all 7 packets or just one tube thing of the caramel VIA? Thanks!! just one little packet. At my walmart-they sold packs of 3 for about half the price of the 7-pack ones. That would be enough for this recipe. SO glad you asked this, i almost just used all 7!!! For this recipe, how many cupcakes does this make? Oh those are great questions! I used the Caramel flavored Via Coffee – but one time I made these, the store was out of that flavor, so I used the mocha flavor. 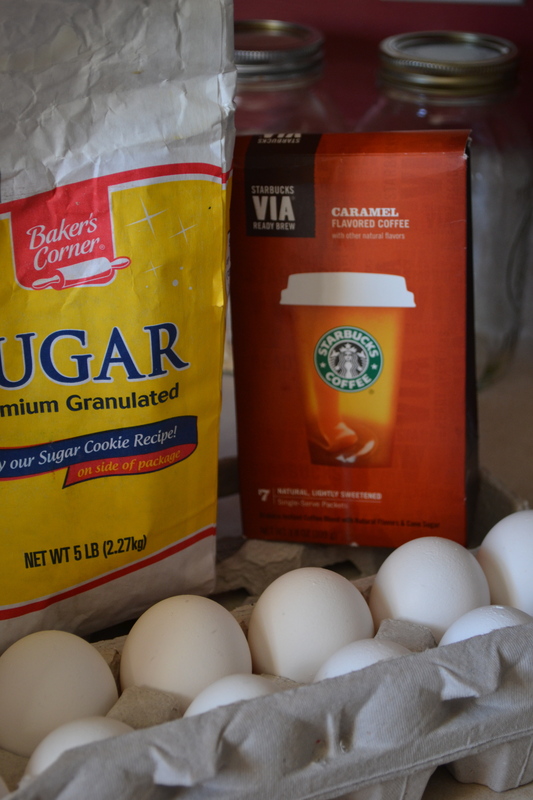 And I updated the recipe to use “2 teaspoons of another pack of Starbucks Via” – thanks for helping me clarify! Be sure to read some of the comments – this recipe has somewhat of a learning curve (especially on the mousse filling) – make sure you really beat that whipping cream as stiff as it can get (but not too much or it will turn to butter) 🙂 and beat the egg yolk mixture until it’s as stiff as it can go, or your mousse will be really runny. It doesn’t affect much at all – except it’s just a bit messier to eat and work with – but I wanted you to have a head’s up about it. 🙂 Good luck! They are a lot of fun to make – but they’re especially fun to serve and get compliments on. You’ll have to let me know how it goes! Bobbie, that’s fantastic! I hope you enjoyed every bit of praise after all that work!! I did, thank you so much for sharing the recipe with us!! LOVE these recipes, I will for sure make some. My son actually works at a local Starbucks. 🙂 I would love to see other pics of the decor at the wedding rehearsal dinner party, I am a wedding planner and love new, fun ideas. Thanks for coming up with these!! I just finished making these. I have to say, they do taste like the drink, but they are super expensive to make, labor intensive, and super sweet! I don’t recommend them for anyone with dietary issues.The caramel drizzle on top is plenty. The Swiss meringue butter-cream frosting mentions salt in the instructions, but doesn’t list it in the ingredients. I punted and used a 1/2 tsp. I don’t think I will be making these again soon. It makes 30 to 36 depending on how much you put in each cup…I filled the cups to 3/4 (30 cupcakes) but I think 2/3 (36 cupcakes) would have been better. You really do’t want to overflow the paper . As these take so much time to make, I was considering making everything and then instead of cupcakes bake 3 layers and put them into a trifle bowl, laying everything on. I bet it would work nicely, Pam. You could always just layer the different parts…you’d probably get enough for at least 2 trifles with this recipe though…so have lots of hungry people around! Very creative and cute… except was the misspelling on frappuccino intentional? Hi Kim! I actually made these yesterday. They were so cute! One question – for the buttercream directions it says to “Heat sugar, egg whites, and salt”, but there is no salt on the ingredient list. I choose to ignore the salt part and hope it wouldn’t need any. Everything came out fine. Is there supposed to be salt in the buttercream? Wow – good find! Thanks for that note – Ill update the recipe for sure. The salt I added was just a pinch or two – I just prefer a bit of salt in my sweet foods, though. I’m sure it was fine without it – it’s probably just a preference thing – not even in the original recipe. I’m glad you took the plunge and tried them out though! How did everyone like them? Everyone loved them! All of my friends are big coffee drinkers, so it was really fun. My favorite part was the coffee mousse. I could have eaten it straight out of the mixing bowl. WOW!! These look HEAVENLY!! Can’t wait to get the ingredients so I can make em just in time for Christmas!!! Thanks for posting the recipe! I made them for a friend’s birthday, and they were a hit. I think I am going to put the extra coffee mouse filling through my ice cream maker and see what happens 🙂 Thanks again for taking the time to type everything up! Oh my word – what an amazing idea! I almost wanna make a batch of that mousse just to try it in my ice cream maker! That honestly is the best idea I’ve heard yet!! The ice cream turned out really good! We are having friends over tonight, and I am going to serve sundaes with the ice cream, some leftover caramel drizzle (thinned with a little cream), and these chocolate decors…http://deliacreates.blogspot.com/2012/01/chocolate-drizzles.html Thanks again for the great recipe!!! Oh, and the leftover caramel drizzle was super yummy on french toast! Just made these cupcakes! They are beautiful! I don’t eat sweets but I bring cupcakes to work weekly so my co workers can be my taste testers! Can’t wait to show these off! These look wonderful! I hope you don’t mind if I use them as a recipe on my blog. Credit will be linked! I can’t wait to try them out. I was wondering what the yield was for these? Plus when you made numerous amounts of the cupcakes did you double/triple the recipe, or just make 1 batch at a time over & over? how much salt do you put in the swiss merinque buttercream please? Jan, just a pinch! Thanks – I should clarify that in the recipe! Ooooh they look really really really delicious!!! I can’t wait to try them out. I’m sure they’ll be a huge hit! Will Starbucks let you buy the cups or did you make them? How much $ did they cost? Really want to tr them. They look so yummy!!! Are these cupcakes mini or regular sized cupcakes? They are regular sized. A tad larger than regular sized actually since I used my pampered chef muffin stone. I got about 28 cupcakes per batch. But where did you get the little starbucks wrappers? I must know! Oh, for the wrappers….I used the cup sleeves from Starbucks! what about the Starbucks logo? How did you get that? what about the Starbucks logo? 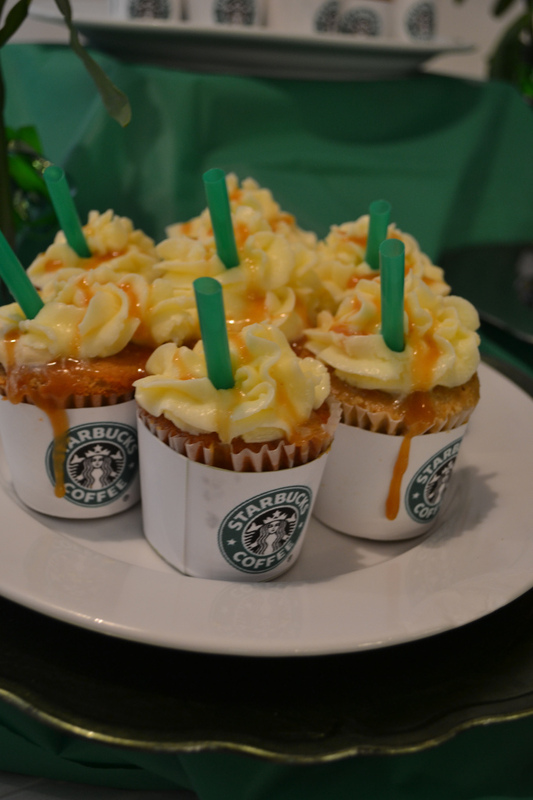 A question for you…The Caramel Starbucks VIA Instant coffee… you use that for the cupcake batter and the mousse, right? In the recipe, it didn’t say instant coffee, just wanted to make sure it was the same as the batter. Also, this recipe intimidates me. Is it really as difficult as it seems?? 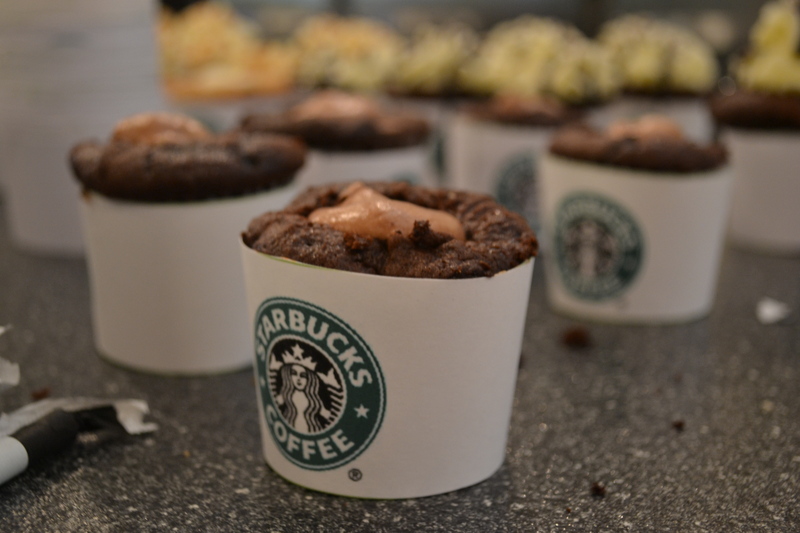 I really want to make these for all my Starbucks addicted friends! I meant to say under the Mousse recipe, it didn’t say instant. Yes – you’re right – you’ll use the same instant coffee for both of them. As far as intimidating – this is definitely a recipe to have a healthy fear of – it is definitely not for the faint of heart! In an earlier comment you said you used less butter than the recipe but you were going to change that in the instructions. Is what I’m seeing the revision or should I minus the butter? I’m preparing my ingredients so that I may muster up the money and courage to attempt this. Where did you get the Starbucks sleeves for the cupcakes? in the list of ingredients, you only mention the instant coffee…yet in the directions you have me add the instant to the milk, and then add ground coffee to the flour mixture? i’m confused! how much ground coffee/what type should i put into the flour mixture? or is that just another packet of the via? what was i supposed to do with the milk + via + vanilla from the first step? Can the mousse and drizzles be made in advance and refrigerated? Absolutely! The caramel drizzle keeps for a very long time – I used it for several different things up to about 6 weeks after I made the cupcakes. The mousse, though, I would think would only last a couple of days. Hi Kim. I found this recipe on pinterest and I have been back to your blog to admire them a million times. I am making them this morning for a meeting at work tomorrow and I am wondering how I should store them. Could you please tell me if I should refridgerate them. Thanks a bunch. Yay! I’m glad you’re giving yourself time – they aren’t a 30 minute ordeal by any means. But you’ll do great, I’m sure! If you had to get them totally ready today, I’d wait to assemble them until late tonight, then refrigerate. but of course you can make all the components earlier in the day. I hope that helps! Definitely come back and let me know how they came out for ya! Last week I had a Starbucks birthday for my friend using these cupcakes as the theme. Yes, they were alot of work, however, well worth it! I made the cake part of the cupcakes in advance and froze them, then day of party I made the mousse filling and icing. I have some decorating tips/ideas which I used and wanted to past them on! For the past month, every time I went into a Starbucks I asked if they had any old advertising material they could give me. I hit a store in Bentonville, Arkansas the day after they changed their promotion and “scored” a really nice 4’x2′ poster! (WIN), another store manager gave me a “stack” of the cookie bags which I hole punched, ran a green ribbon thru to make banners around the room. Another store gave me a “sleeve” of sample cups which I placed around a cupcake stand as spacers. I purchased round sliver mylar balloons and clued cut-out Starbucks logos (printed off the internet) on each side and paired it with green star mylar balloons. The party was a big hit! Thanks for the inspiration, Kim! i just made them right now, and i don’t want to sound a little nutty but they can out PERFECT!!!!!!!!! i don’t know how to show the picture but you have to see them! Oh my – I’d love to see them! You’re welcome to email me a photo at krackley 220 at gmail dot com if you like! Did you use Carmel VIA for the cupcake or regular flavor? I used caramel for that too! Same package (they’re expensive!) I can’t wait to hear how they turn out! Wow! These look delicious. My husband would love them. I saw the recipe on pinterest.com and then I was looking at the rest of your blog. In the “about us” section, I recognized some of the teens in your picture. I’m originally from Parkersburg (now I live in Paraguay where I’m a teacher at a Christian school for missionary kids). I went to Faith Bible Church and graduated from Wood Co. Christian. A few of my friends went to your church in P-burg. Small world. Blessings. Why did you say your brother-in-law was getting married? What happened to your sister? Could it be her husbands brother??? Go for it! And let me know how they turn out!! Seriously evil! But now I have to try them … and then take them to my office and share the love. These are SO adorable. We are doing a coffee bar for my brother’s graduation party so I think I’ll have to add these to the table. How fun! So cute. Oh I can’t wait to try this. 😉 thx for the post. !!! AWESOME cupcakes. My daughter made them for a trial for a bridal shower. Now we are making a double batch for the shower. Do you keep these in the refrigerator? How far ahead of time can you make them. The first batch was a little dry. Any suggestions would be greatly appreciated on how to store. God bless your creativity! These will Be fantastic for a bridal shower! If you’re working ahead, just make up the different components – the cakes, mousse filling, caramel topping, and buttercream, and keep all but the cakes in the fridge. Unless you have a massive fridge, you’ll have to wait to decorate/fill them until you get to the shower…the filling and icing needs to stay refrigerated until the day of the shower. As far as dry cupcakes – trying testing them 2-3 minutes early – it sounds like your oven might be a bit better than mine and could have finished them a little earlier. And please send a photo when your done! I’d love to post a photo of them (with you lovely bakers and the bride to be!) on my blog!! How do you make the Starbucks covers? I tried several of times and just can’t get the measurements. Would love to have the full look. Thanks! For the Cupcake Batter do you mean vanilla syrup, extract or actual vanilla? 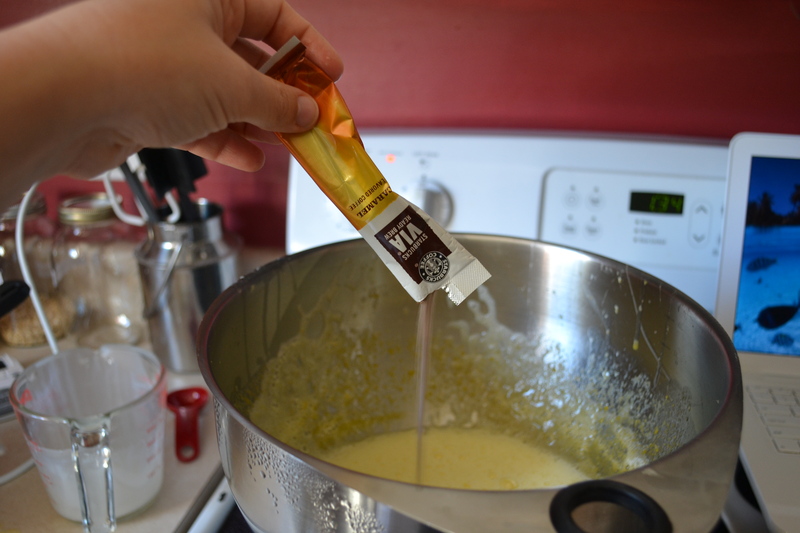 Vanilla extract – send me a photo of you Make them! I’d love to show them off! Can I use the iced caramel via instead of the original caramel via coffee? Oh and what will happen if I just put each whole egg in at a time, instead of seperating them? Thanks for the help! Oh dear! Can you tell me exactly what you did? That’s so strange! Was there a lot of water in your bowl first? Like was it just washed? Sometimes that can mess it up, but it shouldn’t stop it from getting thick – what are you using to mix it up with? Well I bought wipping cream and I put 2 1/2cups in my kitchen aid mixer. And nothing 🙁 Im going to throw this away and start again. I have never heard of such a thing! You are certainly doing everything right – sometimes heavy whipping cream works better – but whipping cream should work just as well – just take a little longer. I am so sorry – that’s supposed to be an easy step! Don’t give up. Perhaps there was something wrong with it – again – you were doing all the right things – so as easy as it is for me to say when I’m not there – don’t get discouraged. I’m so so sorry!! I did it again and it worked great ! I will be taking these for my co workers and my manager who loves startbucks. Thank you !!!! By the way the I had a lot of the mousse left over can I save that for another batch or will it go bad? I will let know know what they think. How and where do you store the carmel? OMG it is heaven! I wish I had these a few yrs ago when my daughter graduated High School. Her theme was Starbucks and Cupcakes-No Joke!! 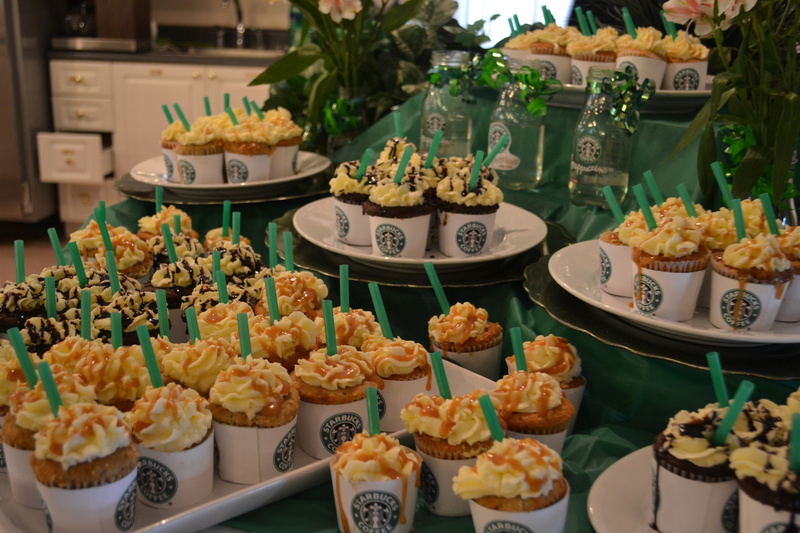 We had tons of Starbucks stuff and every sz cupcake decorated all kinds of ways but not these. I’m excited to make them, I’ve been trying to read the posts, I hate when people repeat things, but I can’t seem to find Ur chocolate chip recipe and I know U were going to post it back in 2011. I’m going to have to make them and photograph them for my kitchen. Its decorated in Starbucks. I have a neon sign, about 25-30 cups from around the states as my border and sm other stuff. I think baking mini cupcakes and putting them in their sample cups wld be adorable too. Just can’t wait…Thx bunches for everything. I think it’s funny because if Starbucks actually sold something like these I would probably buy them in-store as well. The majority of the stuff they sell is just overpriced “eh” . Great job! This probably goes against bakers rules but its worth a shot…..Everytime I bake something I wreck it and I am super intimidated by all these steps, so is there a cheat method…you know use a boxed (gasp) mix and kinda make it my own??? Planning on making these for my upcoming 20th birthday and had a couple questions! I have Christmas Blend Via and I was wondering if I could just add a splash of caramel syrup to give it the subtle caramel that it would get from the caramel Via. Also, how far in advance could the cupcake batter be mixed before being baked? Thanks! Good questions! You could definitely try the caramel splash – but it being a liquid might set your texture off a bit – I’d use your Christmas blend with an extra tbsp of brown sugar and an extra 1/8 tsp of salt. You’d get the same idea – just with dry ingredients. As for the batter early, I don’t know the exact answer to that one. Refrigerating it would mess it up a tad (as far as the rising goes), but I’m sure leaving it on the counter for up to an hour would be fine. If you did have to refrigerate it, you could always try bringing it back to room temp on the counter, mixing it up again a few times, then bake it. That would most likely be almost the same. Happy happy birthday!!! I’m just sorry you have to bake them up yourself! If you lived close to me – I’d do them myself. Oh! That’s perfect! Yeah, I was worried about it being to liquidy so I’ll definitely go for the brown sugar. Thanks for the tip and thank you for the happy birthday 🙂 I’m actually really excited to make them. When I initially found this recipe a week or so ago I went ahead and made the caramel drizzle and it is phenomenal! This last pic is amazing! Love these cupcakes, adorable recipe!!! Is the buttercream frosting with powdered sugar? I assume so, because I just used regular sugar, and it is just a sugar-y, butter-y mess. It might be good to specify for novice bakers like myself. Oh I’m so sorry! It is regular sugar. If you give me a few more details maybe I can help you troubleshoot – the recipe is definitely a bit more difficult. Did you cook it to the right temp? And sometimes if you haven’t mixed it long enough it looks like a curdled mess – sometimes you have to keep going another few minutes and it comes together so beautifully! If nothing else seems to work – you can always add a little powdered sugar and see if that brings it together a bit more. Do you think this recipe would convert to an 8in round cake? Clicked on this because my friend is such a Starbucks fan. As a Pampered Chef consultant, I was extra excited to see the stainless steal bowl as a double boiler. Excellent idea and I can’t wait to try the cupcakes. “Heat the milk in the microwave or on the stove until hot – stop short of a simmer. Stir in the instant coffee until well blended. Add the vanilla and set aside. I wasn’t sure which part of the recipe received what amount of coffee. For the cupcakes it says one package and then 2 teaspoons. Is this for the cupcake and the filling or just the cupcake it self. It was just worded a little weird since there was such a big space half way through the ingredients. Also, can they both be the same flavor, like carmel or just regular? of instant coffee* sorry forgot to clarify. The whole packet goes in the cupcakes – and the 2 teaspoons goes in the mousse filling. Hope that helps! Have fun with them! Good Morning Kim! Could you help my out.,,,,Can you make the cupcake,the filling and the drizzle ahead of time and put them in the fridge or cupcakes in a bag??? Looking and all the work, I’m intimidated about taking this on in one day!! LOL, OK, I’m chicken!! With kids, homework, housework….sigh, life is good!!! These took forever, but they turned out great! I made the full amount of the mousse, so after I had filled the cupcakes, I cut up the cores of the cupcakes and mixed it with the leftover mousse to make a yummy coffee fluff dessert. I think that might have been my favorite part! thoughts on turning this into a peppermint mocha frapp-cake? use mocha instead of caramel with a dash of peppermint extract and crushed candy canes on top? maybe more festive for the winter holidays?? I think it’s a brilliant idea, Lauren! If you try it, let me know how it turns out! do you think there needs to be any sort of adjustment made? also, what would you recommend in terms of the mousse? just add a little peppermint extract and mocha via? I was wondering, is the VIA coffee added into the cake, carmel flavored? It is clear that it is added into the mousse. If you could write back as soon as possible that would be great, I am buying all the ingredients later tomorrow. made the peppermint mocha alternative! i copied your recipe for the double chocolate cake (with the pudding and choc chips) and added 1 tablespoon of peppermint extract. if i could go back, i’d add 1/2-1 more tablespoon but i also LOVE mint chocolate. made the mousse and substituted mocha via for the caramel and again added peppermint extract. followed the recipe for the butter meringue frosting and topped it with chocolate sauce and crushed candy canes. now just waiting for the reviews when i bring them into work tomorrow!! I’m SO confused!!! I have read this recipe several times and have e-mailed it to my mom to look over. neither of us understand where the Pkg of Starbucks Caramel Instant Coffee goes and where the 2 teaspoons of the Starbucks Caramel Instant Coffee goes. Does it all go into the cake batter? How much coffee is added into the heated Milk mixture and how much goes into the baking powder and baking soda mixture? Is the first list of ingredients just for the cupcake batter? It doesnt say. Where does the ground coffee come in? it isnt listed in the first list of ingredients. Oh I’m so so sorry!! I’ll have to adjust that so it doesn’t come up again for anyone else!! “Heat the milk in the microwave or on the stove until hot – stop short of a simmer. Stir in the (one pckg) instant coffee until well blended. Add the vanilla and set aside. And yes, the first list of ingredients is for the cupcakes – the three other component recipes follow. If you’re still having trouble, let me know!!! And good luck! Yes Kim, I’m so sorry for asking again. Lol. How much coffee goes into the heated milk? Ground coffee or the Caramel Instant? And how much? The measurements is what I’m confused about. So sorry!!! Hopefully this will help? Basically, you’re putting in the ingredients in the order listed there. I appreciate your pointing this out- it’ll help me know how to simplify it a bit for everyone! Is the egg mixture the egg whites or the coffee egg yolk water and sugar mixture? OMIGOSH!!! 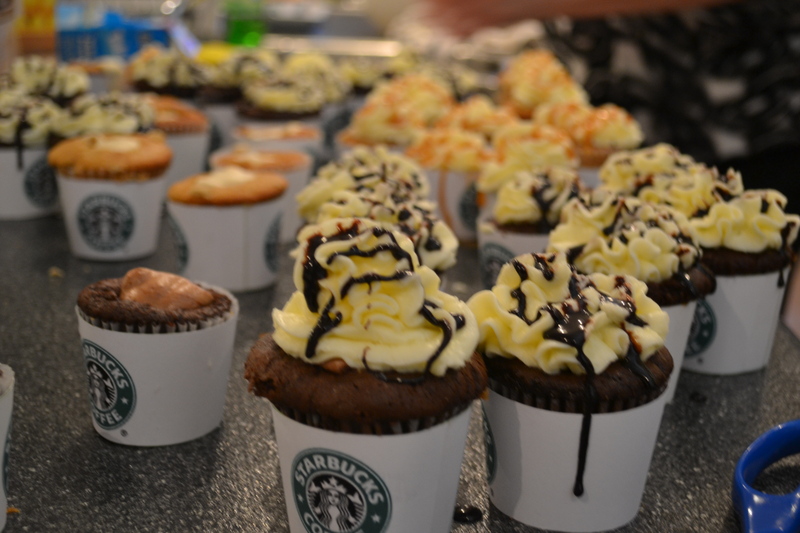 THESE LOOK INCR”EDIBLE” LICIOUS..
JUST ONE QUESTION WHERE DID YOU GET STARBUCKS LOGO CUPS(BORROW THOSE TOO) NOT JUDGING!!! Where did you get the little starbucks cups you used as te cupcake wrappers? We’re they just coffee cups you cut apart? I see that your caramel and chocolate sauce dripped off the cupcakes a bit. If i did these the night before i needed them would the sauce still be good? or would it completely slide off? Hey Justine! Yes – you can make them the night before – just refrigerate them…. Hi Kim, I am a South African that just recently bought a kitchen aid. I have been looking for recipes to try and came across your cupcake recipe. First of all, I too am a sinner saved by grace and it it so good to see that there are people out there not ashamed of the gospel. You are an absolute blessing! Secondly, I most certainly want to try this recipe but we don’t have Starbucks in South Africa. Could I possibly use something else? Hi, just a reader, but starbucks does have an online store you could order from if need be. That is how I got my coffee for the recipe. Great idea, Sam. I didn’t even think about that option!! Hey Rosalyn! Your sweet comment made my morning! Here a really loud hello that hopefully reaches all the way across the oceans to another sister! Absolutely you can use something different! In place of the Starbucks via (which is an instant, just-mix-with-water packet), make up a really strong cup of coffee (like, enough coffee for 12 ounces of water – but use only 6 ounces of water.) and then take the same measurements for everything. That 6 ounces should be enough for everything you’d need – or you might end up making a little more too. These really are delicious and worth every bit of effort! Enjoy your new mixer!! We have a product like that but its cappuccino. I will use that instead. Alternatively, I will use dunkin donut coffee I purchased while visiting friends in Atlanta and in York PA. When next I have the opportunity to visit your beautiful country, maybe I could find my way to your church, who knows! Thank you for a wonderful recipe. I saw it and knew right away that I had to try them. I made them for a co-worker’s birthday celebration. She is a huge fan of Starbuck’s coffee. They were a big hit. I even had another co-worker call the next day to ask if there were any left. It was a good challenge which had me using a candy thermometer for the first time. Hi there mates, good piece of writing and nice urging commented here, I am really enjoying by these. Well hey there! Good luck with your contest!!! These have won a lot! Then, put them together assembly line style the day of the contest. Best of luck! Come back and let me know if you win!! or newsletter service. Do you’ve any? Please allow me realize in order that I could subscribe. Do you think you could do this with a bunt pan or a 9×13 instead of cupcakes? I plan on making 60 of these cupcakes for a sweet 16 party within the next few days with chocolate cutout “16”. Please can you tell me how many regular size cupcakes this recipe yields! Thank you! Oh WOW! What a party. 😉 you’ll need to double the cake recipe and the frosting – but the mousse and caramel will make enough for all 60 as the recipe says. So I am deathly allergic to chocolate, do you think the recipe would be as delicious with Carob? Hello! I will be making these later this week. Quick question though. Do the cupcakes in the main picture at the beginning of the post have cocoa powder in them? Because I noticed there are some chocolate looking cupcakes in the pictures too- are these a different recipe? Thanks!